At the gazebo are, from left, Candy Fenner and Susan Hunt. On Thursday afternoon, March 13, 1930, a group of women from Wilmington met for the purpose of organizing a garden club. By afternoon’s end, 34 ladies had enrolled. At the next meeting, membership in the official Wilmington Garden Club had expanded to over 100 women and men. The original idea was limited to maintaining personal and business properties — manicured lawns, flower beds, trimmed bushes and trees. By 1932, the club was affiliated with the Ohio Association of Garden Clubs (OAGC), also incorporated in March, 1930. Ohio’s 88 counties are divided into 14 OAGC Regions. Region 16 is composed of Clinton, Fayette, Greene, Highland, Madison, and Warren Counties. Each Region has an OAGC Director who helps coordinate activities at the local level, including spring and fall Regional Meetings and State Conventions (to be held this year at Robert’s Center). Regional activities throughout the state appear in a quarterly newsletter, “The Garden Path”. In 1934, the Wilmington Garden Club set collective eyes on a dump across from Wilmington College by the railroad. First named Triangle Park, it is now known as Point Park. Willow trees were eventually replaced by tall and lofty pines, upon which becoming too tall and lofty were removed to create the current flower beds. 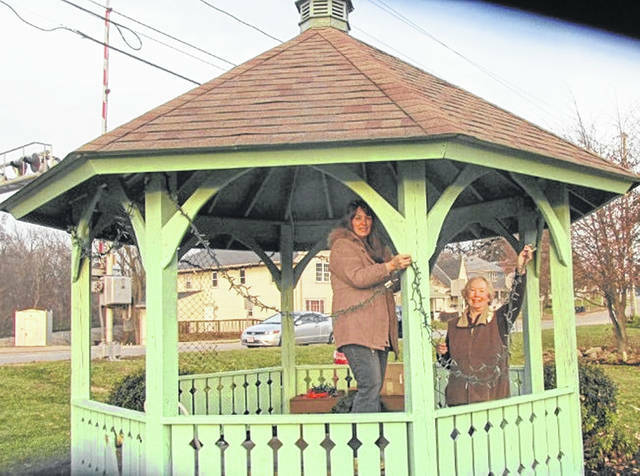 In 1987 a gazebo was designed and built by three members and their willing husbands, helped by willing donations from individual and local businesses. Gardens evolve as each incoming group places their stamp. The only criteria for planting and weeding is the ability to bend down and get back up. The Garden Club makes small gifts for Hospice patients, Habitat for Humanity and nursing home recipients; yearly donates an Arbor Day tree; maintains two flower beds at the entrance to Sugar Grove Cemetery and the Herb Garden at the Historical Society; holds an annual $2 plant sale (always a sellout); and gives annual beautification awards to individuals and local businesses. Monthly meetings are held the second Monday at 1:30 p.m., usually at Cape May. Speakers cover a range of horticultural subjects, leaving us edified. Deserts leave us fed. One does not have to be a horticulturalist nor advanced floral arranger to join the Wilmington Garden Club. One will find friendship, laughter, a tad of gossip and a very good time. The current Membership Chair is Carol Davidson, 19 Meadow Run Trail, Wilmington, OH 45177.